Melbourne Business School, home to Australia’s first MBA program, has launched a new Hellenic Scholarship to support students living in Greece or Cyprus to study in Australia.Â The scholarship was created in collaboration between Melbourne Business School, the Greek Community of Melbourne and the Hellenic Australian Chamber of Commerce and Industry (HACCI). 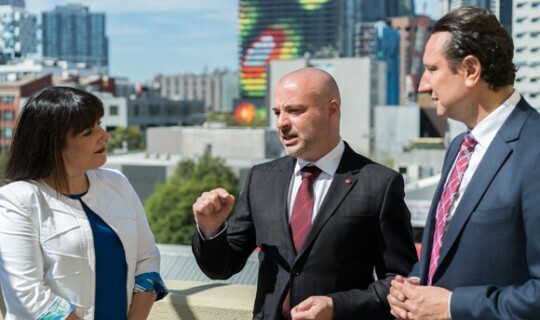 Melbourne Business School’s Director of Corporate Relations and Partnerships, Alex Christou said the new Hellenic Scholarship would provide financial assistance to a Full-time MBA candidate meeting the requirements of entry in to the School’s Full-time MBA program. “Melbourne is home to the world’s largest Greek-speaking community outside of Europe, who contribute greatly to our city’s economy, culture and community,” said Mr Christou. The scholarship was created in collaboration between Melbourne Business School, the Greek Community of Melbourne and the Hellenic Australian Chamber of Commerce and Industry (HACCI) Mr Christou said. Bill Papastergiadis, President of the Greek Community of Melbourne and Victoria added, “It’s imperative that we support those most talented in Greece with the opportunity to realise their full potential by completing a reputable and world-class MBA program such as that being offered by Melbourne Business School. We will work with the community to provide the worthy recipients of the scholarship accommodation and support for the duration of the program whilst in Melbourne”. Georgegina Poulos, Chair of the Board for HACCI says that this opportunity has come at a critical point where many of the most gifted individuals in Greece have very few employment prospects. The MBA program will build on their previous studies and work experience and open up new employment opportunities. Funding for the scholarship was provided by anonymous donors to the School, and Alex Christou thanked the donors for their support. “As a non-profit provider of business education, our donors are essential to achieving our mission of enabling individuals and organisations to be global leaders through the creation, application and dissemination of business and economics knowledge,” Mr Christou said. Interested individuals are encouraged attend the next information session in Greece on Wednesday 26 April and visit mbs.edu/hellenicscholarship for further details.